I remember at school that playground fights were great events. Two boys would fall out, start pushing and shoving each other and immediately a crowd would gather around them, egging them on. As teachers were always very quick to intervene, a fight had only a very limited lifespan, a minute or two, max. 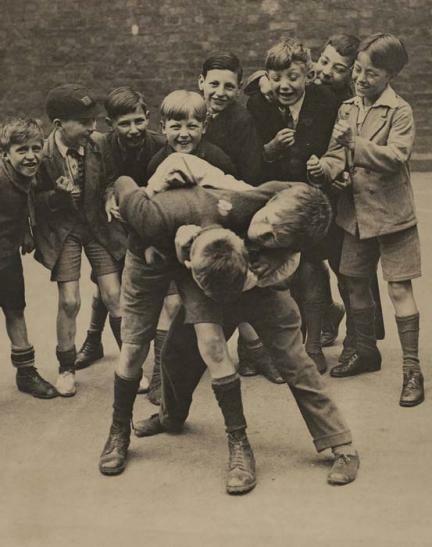 Within a few seconds there would be a mass of bodies shouting and cheering and two, often rather bemused protagonists, in the middle of the mêlée, wrestling. It struck me in my morning bible reading today that this is an important question for Christians too. In the story recounted in Exodus 17, the people of Israel have been attacked by the Amalekites. They go out to fight them – fighting for their national survival. As Joshua leads the Israelite army as they fight, Moses and his assistants go up on to an overlooking hill and Moses holds up his hands. The act of holding up your hands is an external sign of prayer. An indication of a conviction that God is the one on whom the Israelites are relying upon to win this battle. As Moses’ arms tire, and his hands fall, the Amalekites start to gain the upper hand. As Moses hands are raised, the Israelites prevail. Both God’s activity and that of Joshua and his army were important. But only God’s was crucial. God could no doubt have defeated the Amalekites without Joshua; but Joshua was incapable of defeating them without God. In our lives and our churches how well do we express this truth? How much of our activity is accompanied by ‘the raising of our hands’? The public expression of our conviction that without God we can achieve nothing? It is helpful to keep asking ourselves the question, ‘who’s fighting?’ So that we can focus our eyes on the One who leads, guides, strengthens and Who gives the victory.